We’re thrilled to bring you the exciting sequel, GHOST TRAIN TO NEW ORLEANS (US | UK | AUS), which is available now! Zoe and crew head south for an assignment in the Big Easy. Since today is also Mardi Gras, it seemed appropriate to ask for Mur’s excellent travel advice on enjoying the celebration….if you’re a vampire that is. The most difficult thing in New Orleans for vampires is accommodation. New Orleans is 8 feet under sea level, and graves and coffins and any sort of tunnel system are nonexistent. You must plan early to book a crypt, or find room in some of the hotels that feature sunlight-tight rooms. These hotels and the rentable crypts are often booked by November, so plan early. Every city has laws specific to itself, for example, no earth demons welcome in Boston, and zombies must visit only downtown hospital morgues for brain retrieval. New Orleans is no different. Hunting can only be done in the cemeteries, all parties must be invite-only to limit the number of humans that try to attend, and the legally drunk limit is drinking one pint of blood that has a .10 blood alcohol content. So watch how many parting humans you partake of. Mardi Gras in New Orleans is the one time and place where you can be yourself. You can dress in clothes that you find comfortable, even if they are from the 1300s, and you can avoid putting on makeup to disguise the paleness of your skin. Out and proud, that’s the chant of local vampires, as they proudly display all that they are this one time during the year. If you attend the correct parades, you may have a chance to catch throws such as frozen blood cubes, candied brain bits, or hedgehogs. These parades are often late at night on side streets to not attract too much human attention. WATCH OUT: some hunters will throw rosaries and crucifixes at eager vampires looking to catch throws, so make sure you know what you’re asking for when you get your loot. Many parades will allow you to join them, if you ask before the parade begins. Parades are a wonderful opportunity for all supernatural creatures to walk in the open with no disguises. Even larger creatures such as dragons and wyrms can pass themselves as floats in a parade. But do not join a parade as it’s moving along; the vampires in the parade may see that as a threat. Since so many supernatural creatures fit in seamlessly with the chaos that is Mardi Gras, many sire vampires will use it as a “coming out” party or “Debutante ball” for their newest progeny. The baby vampires will likely still be hesitant to use their new powers, but most likely they will be excited for the opportunities to hunt and party and get drunk like they did in life. This means they will be more liable to step out of line, attract the attention of the authorities, accidentally kill a party attendee, or worse. It’s a fun, family-friendly event, but that doesn’t mean your children don’t need watching. Remember what we said about accommodations? We have more vampires killed simply by being out all night and suddenly unable to find a safe place to hide when the sun comes up. And we’re talking old vampires, people who really should know better. But there is no better place to feed freely on drunks than Mardi Gras in New Orleans, and even the most cautious vampire can get in trouble if she has had a few too many tourists. You do not want to realize it’s 5am and your only sanctuary is a porta potty, which isn’t very light tight to begin with. You can actively hunt in the graveyard, and even show many of your true colors to drunk humans who think you’re just kissing them roughly on the neck. Anything goes at Mardi Gras, which makes it an ideal vacation spot for vampires and other supernatural creatures. But when you step into the working part of the city, where there are fewer parties and more people just trying to enjoy an evening, you will stand out, and the authorities will notice you. Stay in the French Quarter, stay within the invite-only parties, and stay within the cemeteries. Read an excerpt from GHOST TRAIN TO NEW ORLEANS or start from the beginning with THE SHAMBLING GUIDE TO NEW YORK CITY! 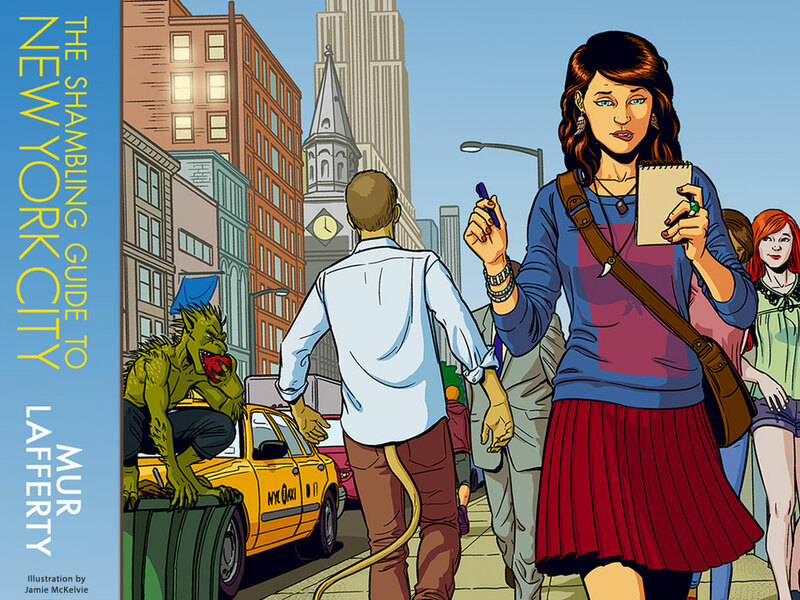 In writing THE SHAMBLING GUIDE TO NEW YORK CITY (US | UK | AUS), a book about a travel book for monsters, there was, sadly, a lot I had to leave out. Originally I wanted to write a full travel guide to go with the novel, but ambition beat me down with a club. Or is that hubris? Anyway, there was a painful encounter with a metaphorical club, and I had to settle for writing little excerpts from the book to put at the end of each chapter. Vampires: You already know the most important things, your own coffin, your hometown soil (if you’re from Eastern Europe), and plenty of sunscreen. The City that Never Sleeps is very friendly to vampires, considering very little shuts down by the time you wake up, and often it’s so bright that you can get a fleeting feeling of daylight. But you must make sure your thrall has everything he or she needs, especially credit cards, cash, and possibly weapons. They will need to hire a car that specializes in coffin-transport (unless you like to live on the edge and arrive at night and hope you find a hotel room – your chances are good, but there’s always a risk!) Also remember hell notes and blood tokens, they’re the best way to barter with the Red Cross. This is a big week for us in the New York office. Book Expo America begins this Thursday. For three full days of signings, panels, and events, New York City will host authors, agents, and book lovers from all over. 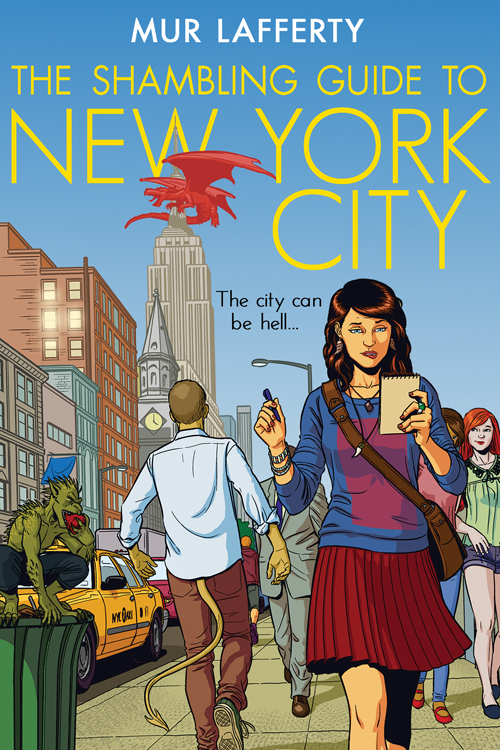 So it is appropriate that this week marks the publication of Mur Lafferty’s debut novel, THE SHAMBLING GUIDE TO NEW YORK CITY (US | UK | AUS) in trade paperback, ebook, and audio formats. 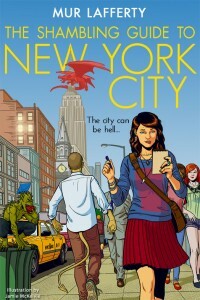 THE SHAMBLING GUIDE TO NEW YORK CITY follows the adventures of Zoe, a recent New York transplant, as she struggles to settle into her new job in Publishing and life in the big city. Sounds pretty normal right? However, if there is one thing that I’ve learned over the last five years, nothing is ever completely normal when it comes to New York City. As it turns out, humans aren’t the only ones to call New York home. For the release of novel, we wanted to show you a bit of Zoe’s New York which is as mysterious and wonderful as the real thing. Click here to view a map of some of the hidden places of New York City where we fragile humans dare not go. For those of you who are attending BEA this week, be sure to stop by booth #1828 to pick up a printed copy to take home with you. We’re absolutely thrilled by the reviews that this debut novel has already received, and hope you will enjoy it as much early readers have. If you want to sample the novel for yourself, click here or go to Mur Lafferty’s site and listen to an audio sample. The first four chapters are online now, but you can purchase the entire audiobook from Hachette Audio today. Upcoming Online Event: Chat With Mur Lafferty! Chat with author and podcaster Mur Lafferty next week in a live, interactive event brought to you by Shindig! You may know Mur as the host of the award-winning “I Should Be Writing” podcast or for her work with “Escape Pod,” which publishes audio science fiction short stories — now get to know her as an urban fantasy author. This event will be live on Wednesday, May 22nd from 6:30-7:30 EDT. RSVP today. 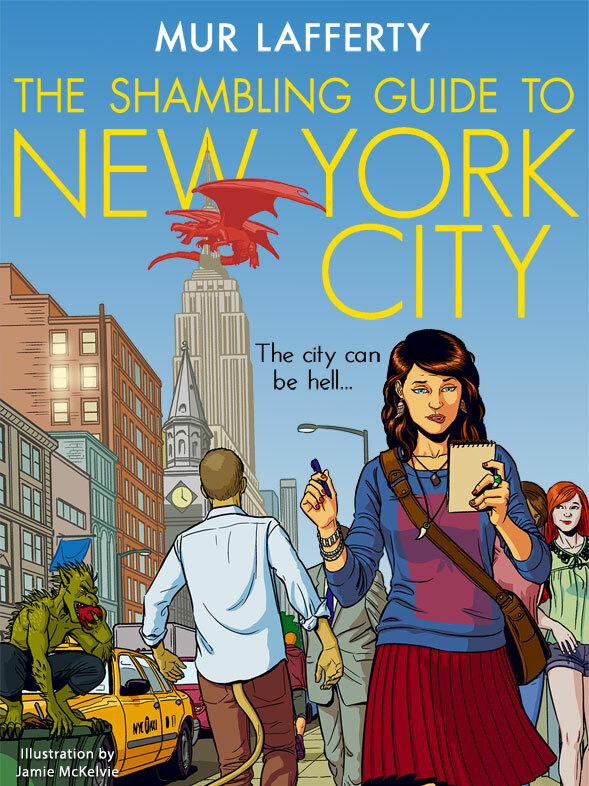 Mur’s book THE SHAMBLING GUIDE TO NEW YORK CITY (US | UK | AUS) will be out on May 28. Listen to an audio excerpt on Mur’s website. You meet a lot of interesting characters in New York City as Zoe will tell you. Watch the trailer below for Mur Lafferty’s upcoming novel THE SHAMBLING GUIDE TO NEW YORK CITY (US | UK | AUS) . Ready for more? Head on over to Mur’s website to listen to the first and second chapters of THE SHAMBLING GUIDE TO NEW YORK CITY in an ongoing audio serialization of the novel. Don’t feel like waiting? Pre-order the entire audio book today from your favorite retailer. This book releases on May 21st! New York City. It’s a city that those of us in the US offices are really quite fond of as you might imagine, and it’s a city that has a personality like no other. 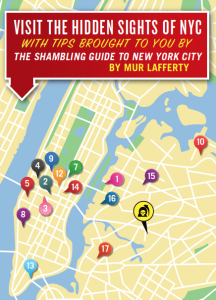 This May, we’re really excited to be publishing Mur Lafferty’s THE SHAMBLING GUIDE TO NEW YORK CITY (US | UK | AUS). The terrific cover by Jamie McKelvie has personality in spades—not unlike Zoe, the intrepid, young journalist and recent New York transplant who stars in THE SHAMBLING GUIDE TO NEW YORK CITY. Here is a set of wallpapers for your computer and electronic devices to tide you over until the big release day. Enjoy! The nominees for the 2013 Hugo Awards were announced over the weekend; you can find the full list here. Congratulations to all the nominees! We’re especially thrilled to have several Orbit authors among them. 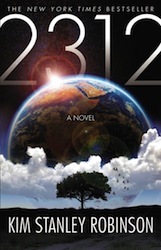 Nominated for the Hugo Award for Best Novel are Mira Grant’s BLACKOUT (US | UK | ANZ) and Kim Stanley Robinson’s 2312 (US | UK | ANZ). 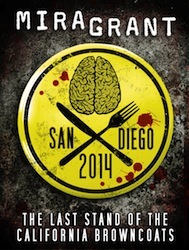 Nominated for Best Novella is Mira Grant’s San Diego 2014: The Last Stand of the California Browncoats, published by Orbit Short Fiction. Mira Grant was also nominated, as Seanan McGuire, for three other Hugo Awards in the Best Novelette and Best Fancast categories. She breaks a record as the first person to appear on the ballot five times in a single year! In addition, Mur Lafferty was nominated this year for the John W. Campbell Award for Best New Writer, for the second year running. We’ll be publishing Mur’s novel THE SHAMBLING GUIDE TO NEW YORK CITY (US | UK | ANZ) next month. Happy New Year from the Art Department! We’re starting 2013 off right and releasing a cover we know some folks have been very eager to see: THE SHAMBLING GUIDE TO NEW YORK CITY (US | UK) by Mur Lafferty! I was extremely excited to commission an artist I’ve loved for a while now, a rising star in the comics world, Jamie McKelvie, to do the illustration. I first met Jamie’s work on the comic series Phonogram (if you like music and comics you really need to check it out), and especially loved his take on the original X-Men in the X-Men: Season One graphic novel that came out last year. Really, his Jean Grey might be my favorite. I knew his art would match the cool urban hipness of Mur’s writing. And he really captured the feel of NYC-with-a-supernatural-side portrayed in the book. After we got the illustrations in-house we had some design help from the talented Nina Tara. 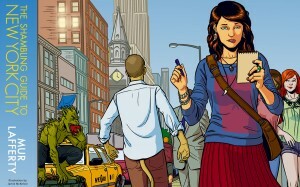 Being a native New Yorker, I really enjoyed the way Mur has created a supernatural side to the city that could be hiding under our noses, and Zoë is a fun character. I look forward to getting to know her better.